Yaowawit Lodge is integrated in Yaowawit School which is a school for children of socially disadvantaged background and is supported by the Children's World Academy Foundation. 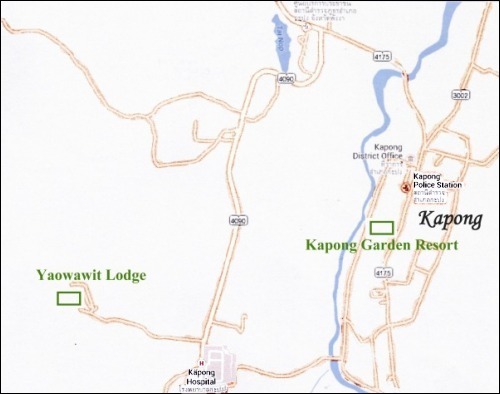 Yaowawit Lodge is situated in the western outskirts of Kapong town (off route 4090), surrounded by agricultural fields in the valley and pristine jungle on the slopes and in the hills. Yaowawit School was initially founded to help the victims of the 2004 Tsunami. It later expanded to offer new perspectives to children from the poorest of the poor. Her Royal Highness Princess Maha Chakri Sirindhorn inaugurated the opening of the Yaowawit Lodge in March 2008. The Lodge has four deluxe guest rooms and two large suites, a lobby, a restaurant as well as a large lounge. This is a rural area completely unspoilt by civilization. The six bungalows are situated at the lower end of a slope, the upper end being occupied by the school buildings, offices, restaurant, and the communal rooms. The bungalows are very spacious and well equipped with a beautiful bamboo bed and ample sitting facilities. The interior is sparsely but tastefully decorated. The rooms have air conditioning and a ceiling fan as well as warm water shower. For all rooms there is one large living room. From Yaowawit Lodge a lot of excursions are possible in the surrounding area, whether by foot or by bicycle. They lead to waterfalls in the jungle, to natural hot springs, to Buddhist temples, to the town and to small villages in the flat valley.